We’re once again entering the world of movie studios buying rights to a book before it even comes out. 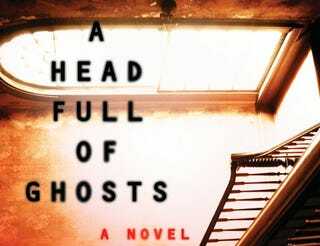 In this case, it’s Focus Features getting ahold of Paul Tremblay’s A Head Full of Ghosts, due out June 2nd. The premise is not only interesting, but seems well-suited for adaptation to a visual medium: a family has to deal with the 14-year-old daughter shows signs of mental illness. As you do, the parents turn to the local Catholic priest for help, which leads them to an exorcist. In order to pay for the exorcist’s help, the family agrees to be part of a reality TV show called The Possession. The show becomes a hit, and the viewers at home get more than they expected. The reality show angle is really fascinating, since the Deadline story also says that people think the whole show is a hoax. How much this family is being taken advantage of does seem to be a big issue, and it seems like the in-universe doubters are going to be put in their place. Deadline says that Focus is looking to have the script written by Ben Collins and Luke Piotrowski.